CyArk is an organization building an online library of 3D models of the world's cultural heritage sites. Mount Rushmore is one of the places that CyArk features in their galleries of 3D models. You can find the entire collection of places here. 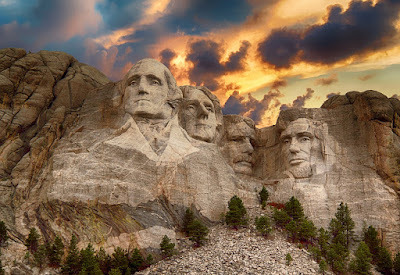 In the CyArk lesson plan collection you will find a handful of lesson plans about the mathematics connected to Mount Rushmore. Scroll down to items 17 through 26 to find the lesson plans about Mount Rushmore. In these lesson plans you will find activities for teaching measurement, geometry, and algebra. There are lesson plans available for K-12. Some lessons are as simple as identifying shapes while others are as complex as predicting when two cracks on the surface of Mount Rushmore would intersect over time.